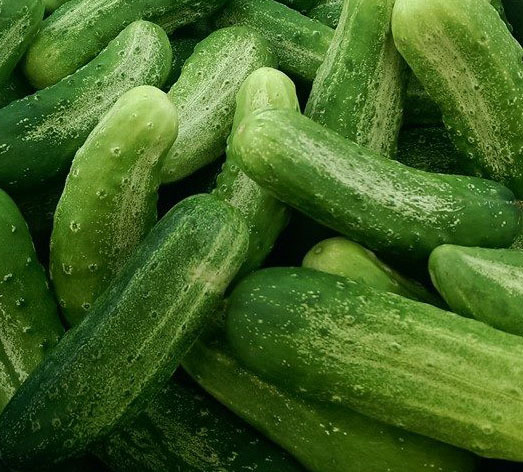 You may have noticed that the market has been swimming in cucumbers lately. Here’s a great way to utilize cucumbers. This is a recipe I taught recently at an introduction to fermented foods at the Missouri River Regional Library. These pickles must be refrigerated after the fermentation occurs, just save a spot in your fridge – it’s worth it! The tannin in the grape or oak leaves help keep the pickles crisp. Make sure to use fresh ingredients. This is not a recipe for pre-chopped, bottled garlic. The library has some great books on fermentation, if you’d like to learn more. Trim the blossom end off the cucumbers. Combine the chlorine-free water and salt in the pitcher. Place the seasonings and leaves at the bottom of the jar or crock, followed by the cucumbers. Pour the brine into the crock or jar. Weigh down everything so it stays submerged. If needed cover the top of jar with a cloth and secure with a rubber band or twine. If a little mold grows on the top of the brine, it is not a problem – just remove it and continue. But, if there is a lot of mold, and it has long tendrils reaching down into the brine, it is a problem. Chalk one up to experience and send your pickles to the compost bin. By LU Market Manager in Uncategorized on July 28, 2014 .